Now that harvest is rapidly winding its way way to completion, many farm tenants and landowners will quickly turn their attention to cash rental rates for 2017. Cash rental rate decisions and discussions can often be challenging, especially in times of rapid commodity price changes. It is no surprise that cash rent and farmland values probably account for largest number of questions that we receive from readers and seminar participants. Since David and I started writing these articles, we have written extensively about cash rental rates. For instance, David recently addressed how rental rates changed at the county level in this post. I was recently reflecting on the articles and topics that we have addressed in the last two years and came across the second post that we published on this site. It provided a perspective on changes in cash rental rates from mid-2014. I have copied it below since many of our current readers may not have had a chance to read it. I think much of the content and topic is quite relevant today and I think readers will find the discussion of the cash rental adjustment process interesting. Just to set the stage, in 2014 commodity prices had just started their decline and there was a lot of discussion about whether rental rates would quickly adjust lower. At the time it was not clear that commodity prices would remain at depressed levels. In the post we talked about how expectations would influence cash rental adjustments. We noted that we had rarely seen cash rental rates decline by more than 5 percent in any single year. In analyzing the situation we plotted cash rental rate changes for Indiana farmland. I have updated that chart which is shown below. Figure 1. 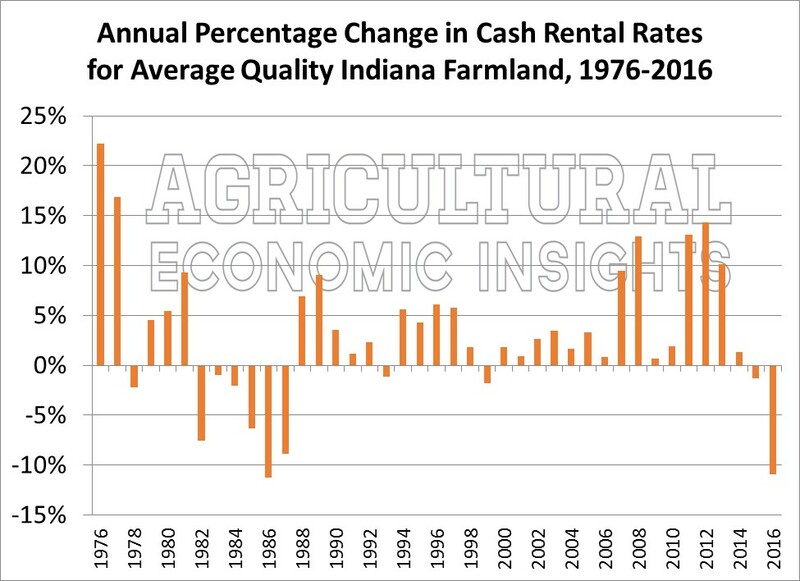 Percent Change in Cash Rental Rates for Average Quality Indiana Farmland, 1976-2016. Source: Purdue Farmland Value Survey. The data in Figure1 show that the declines have now begun to accelerate as the likelihood of sustained low commodity prices has taken hold. In 2016 cash rental rates declined by 10.9% the second largest decline seen in the data. The only larger decline occurred in 1986 when rates fell by 11.2%. Clearly, cash rents are working lower. This is in line with our thinking then and perhaps best expressed by the quote that we used to introduce the post. Simply put, farm economics drive cash rental rates. If farm economics undergo a sustained period of decline one should expect rents to follow. However, I think that at the time we did not expect the prolonged downturn in farm economics that we are now experiencing. It appears that rents may have indeed overshot to the upside in the great commodity boom. As we noted in 2014, the cash rental rate adjustment can be significant in such situations. A number of factors will determine where things go from here. They include how long commodity prices remain depressed and whether the declines continue. As we noted in 2014, government program payments will also play an important role. With payments set to start declining for the crop to be planted in 2017, one might expect that this too will work against cash rental rates. Time will tell. The next chart shows the percentage change in budgeted return over variable plus expected government farm program payments for average quality IN farmland alongside changes in cash rental rates over the shorter period of 1992-2013. It is important to understand that the budgeted return is the return that a farmer might expect prior planting a 50/50 corn soybean rotation on average quality Indiana farmland. The actual returns achieved differed depending on the yields and prices ultimately received. One can see that expected contribution margins are much, much more variable than cash rental rates. Even with several years where expected contribution margins declined, cash rents only adjusted downward in 2 years. This graph does not include the substantial declines that occurred in the 1980’s because there is no historical budgets for this period. 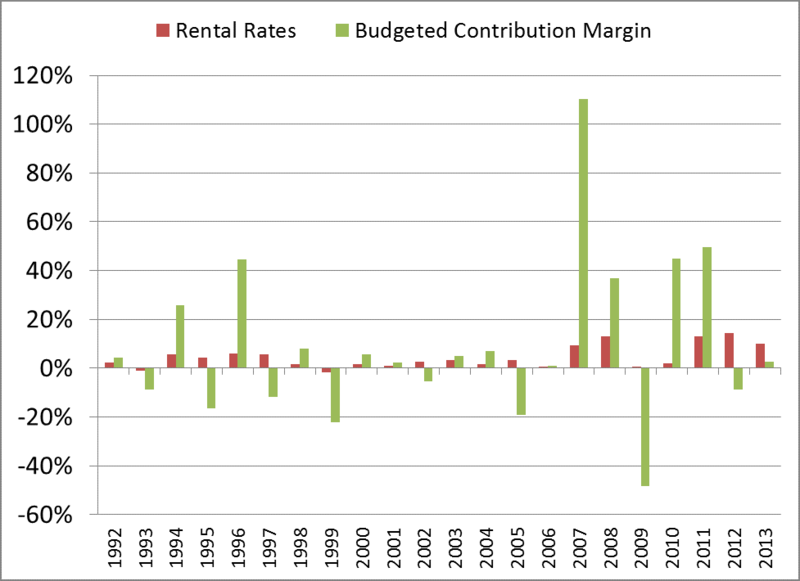 One is also able to see the larger increases in rents that have been associated with the substantial increases in contribution margins of recent times, but in percentage terms rents have not increased as much as they did in the mid to late 70’s. For a longer comparison period, the annual percentage change in the average marketing year corn price was compared to the annual percentage changes in cash rental rates from 1975-2013 and are shown below. This chart again shows that, like contribution margins, commodity prices are much more variable than cash rental rates. When several years of large negative price changes occurred in the 1980s rents made their major downward adjustment. 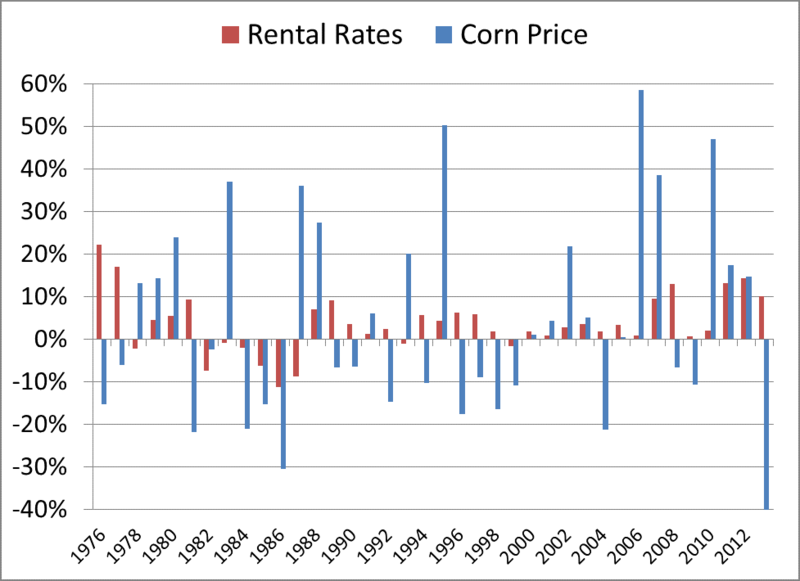 However, several years of fairly large downward corn price changes in the 1990’s did not bring about the same change in rents. Why not? First, the government made substantial payments to farmers in this time period. Second, rents had just been through the large decline of the mid-80’s and likely overshot on the downside. In fact, after hitting $106 per acre in 1981 cash rents did not reach $100 per acre again for 15 years! That brings us to today (2014). 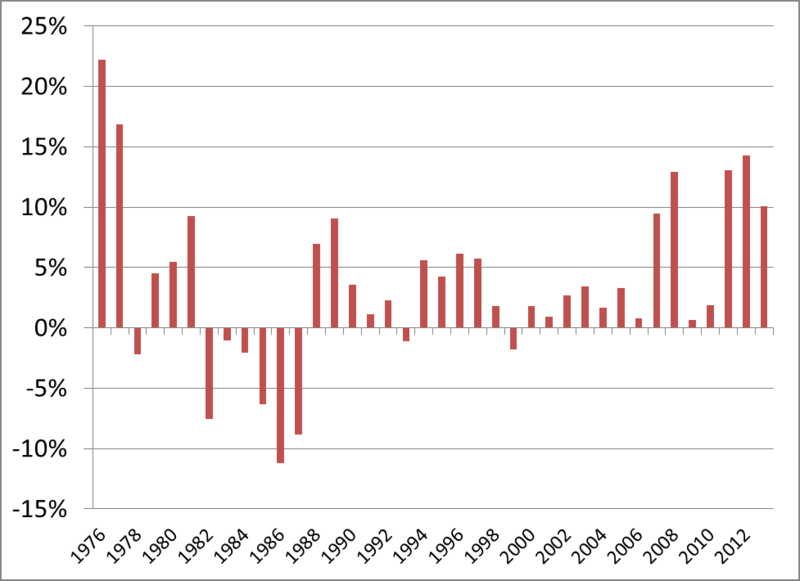 In percentage terms, the most recent decline in corn prices is substantial and bigger than any that occurred in the 1980’s. One must also realize that this decline is from the drought induced high prices of 2012, which were at a level that few market participants likely thought sustainable. One might expect to see some declines in rents going forward, but changes in statewide averages of more than 5% would be large in the context of history. Observation would suggest that when rents decline substantially, it will take a period of years for them to work lower. Were corn prices and contribution margins to show another decline like the one from 2012 to 2013 then perhaps one might question whether rents have overshot as they did in the 1980’s. If that happens expect rents to decline over a period of years. However, given the new farm bill one would expect that corn price declines of that magnitude will again result in substantial government payments to farmers, buttressing rents against an outright collapse. If corn prices remain at current (2014) levels on should not expect to see large changes in statewide average cash rents. However, keep in mind that individual cash rent agreements signed at prices well above the state average will likely see the possibility of much more substantial price declines if the margins above variable costs continue to contract.